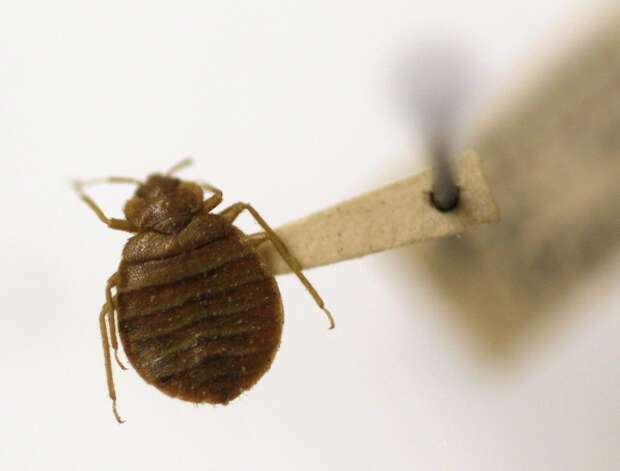 In this file photo, a bed bug is displayed at the Smithsonian Institution National Museum of Natural History in Washington. San Francisco Public Library officials say patrons should not be concerned about bringing home bedbugs with books, despite a growing problem with the pests moving into more commercial and public spaces. Library spokeswoman Michelle Jeffers said she and her colleagues had received several calls and at least a couple of e-mails since a New York Times article reported that the pests have been found in libraries around the country. “I tell them San Francisco Public Library has never had a bedbug infestation, and we have protocols in place to handle it if it comes about,” Jeffers said. Bedbugs are increasingly turning up in public spaces. A 2011 survey of U.S. pest control professionals found most calls about the bugs came from hotels, college dorms and nursing homes. And 8 percent of exterminators said they had treated libraries, according to the survey, which was done by the National Pest Management Association. In 2010, the most recent year for which data is available, San Francisco reported 567 bedbug complaints to the California Department of Public Health – the most of any county in the state and more than twice the complaints the city reported in 2005. Senior Environmental Health Inspector Nader Shatara, who coordinates inspections of possible bedbug infestations around the city, said books wouldn’t be attractive long-term hiding places for bedbugs but that hatchlings could travel on them. Karen Cohn, senior industrial hygienist at the city’s environmental health office, part of the Public Health Department, said city employees in all possible bedbug hot spots have been trained to look out for the pests. Cohn said she typically warns people about picking furniture or linen off the street or buying it from yard sales or secondhand stores. Cohn recommends taking suspect linen or clothing home in a sealed plastic bag and running them through the dryer’s hottest setting for at least 30 minutes to kill any unwanted hitchhikers. A new city ordinance took effect Dec. 14 that will require exterminators to notify the Public Health Department each time they treat for the bugs. Cohn said they city will start receiving reports from exterminators in January. Bedbugs in the Bay Area can live for up to 12 months without eating, according to Dr. John Swartzberg, who teaches infectious disease classes at UC Berkeley and edits the school’s public health Wellness Letter. Adult females can lay up to 500 eggs in their lifetime. And they are notoriously difficult to eliminate. The National Pest Management Association found that 73 percent of exterminators thought bedbug infestations were the most challenging problem. The U.S. Centers for Disease Control and Prevention and the U.S. Environmental Protection Agency have suggested that the bugs could be developing resistance to available pesticides. The bugs are afraid of light, and they plump up with human blood after a midnight feeding. Many bedbug victims awaken in the morning with itchy red welts wherever they were bitten, but some people don’t respond to the bites. They may never know about the uninvited roommates. If you suspect a bedbug problem, the city recommends you contact your property manager or a licensed pest control operator immediately. Complaints about bedbug infestation handling should be reported to San Francisco’s environmental health office by calling 311.